Last Monday we talked about taking some non-essential programs out of the “auto-startup” process in order to speed up your computer. Today we’ll go over an easy way to figure out if you should actually uninstall a program from your Windows computer. You know how it is – when you go into Control Panel to the area where it lists all the programs that are there (it’s in the “Programs and Features” section), it can be a little overwhelming to decide what programs are not needed. On the other hand, you don’t want to just forever accumulate more and more software and never get rid of any of it. In most of the computers I see, there are programs installed that the owner didn’t even intentionally put on there – they just “slithered in” with some other program – so you definitely want to get rid of those. There are probably several programs installed on your computer that have names you aren’t familiar with. 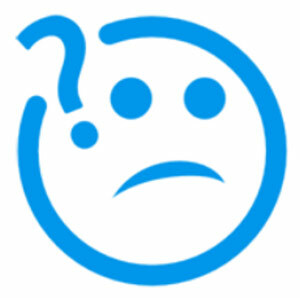 How do you know if it’s something you can get rid of, or if it’s something you need? That’s where ShouldIRemoveIt comes in. It’s free software you can get at ShouldIRemoveIt.com. It’s free. I checked out the program and it seems to do a pretty good job. 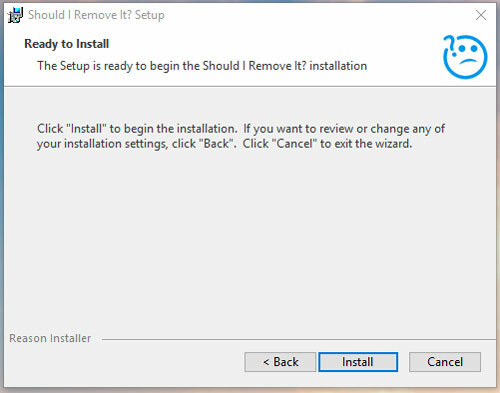 But here’s the trick – the program itself doesn’t make a particular recommendation about whether or not you should uninstall something from your computer. It just gives you more information about it, AND it tells you what most other people have done with it. Then you can decide for yourself if you want to keep it or get rid of it. Go to the website and just click to download the program. Watch out for some misleading ads on the site – they’ll have a big green “Download” button to, in hopes that you’ll mistakenly click on that instead. Hate those ads. If you use an ad blocker, you won’t see them. I disabled my ad blocker just for this review, and believe me – this site is pretty bad with the deceptive ads. Download and run the installer as normal. I was happy to see that it didn’t try to sneak any junk in with it. When the installation finishes, you can choose to launch the program immediately. At that time, it will also open a new webpage with an invitation to download some other program that you don’t want (the one I was presented with was some program to check for outdated drivers and update them – those are always junk). That’s some irony – the website that’s showing you how to get rid of unwanted programs is also advertising unwanted programs. 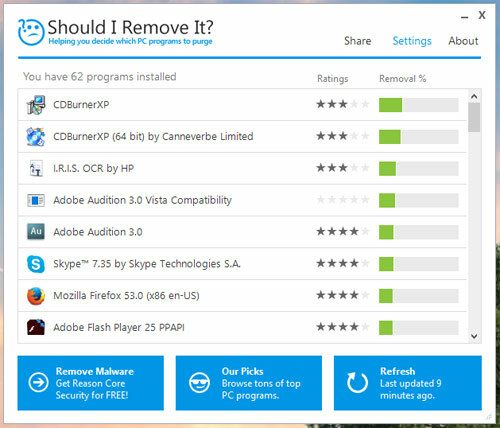 As you can see, for each program it also displays a column for “Ratings” and another column showing the percentage of people who removed that particular program from their computer. So I can see that 29% of other users have removed it, and also some other information such as what version it is, when I installed it, and the size of the installation. If I want to, I can just click to uninstall it. But there’s that other button that says “What is it?”. That’s where you can get more information about that program… but only after you view and close another obnoxious ad for crappy “driver update” software. This one is a huge display ad right in the middle of the page, covering all the text. Just click the “X” to close the ad (or better yet, use an ad blocker and never see that junk). As I said, that’s a lot of data about one program. I don’t know if all of the other programs in their database are covered in that much detail. Most users probably wouldn’t even need that much information, but it’s nice to know it’s there if you do need it. There’s one other thing about this program that’s good – it doesn’t run all the time in the background. It just gets installed on your computer and you can run it when you want to use it, so it’s not constantly using your memory and processor and slowing things down. And of course, you can uninstall it whenever you want to. So overall, I would recommend giving this one a try – just make sure your ad blocker is ready for the barrage. topics according to your client demand or you can be exclusiveist in some unique areas.